David Hourigan & Don Fennessy enjoying the trip. On Saturday July 11 a group of 26 members of the Museum Society departed the museum for a boat trip from Penrose Quay, Cork to Cobh. 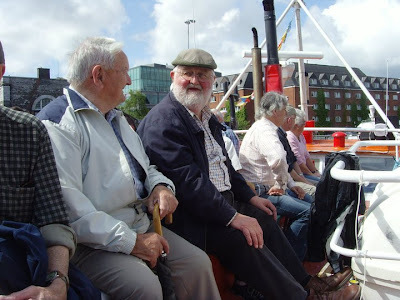 The boat trip with on board commentary took an hour and a half and was enjoyed in beautiful sunshine. On arriving in Cork the group had a very pleasent meal at the Commadore hotel and then spent some time visiting some of the sites in this historical town, the Cathedral, the old cemetery, and the Sirius Art Centre. Arriving back in Dungarvan at 6.30, the group described the day as very relaxing and enjoyable. We would like to thank O' Brien's bus service for transporting the group for the day and the Commadore hotel for the lovely meal. Visit us on facebook to view more photos of the day.